On Tuesday evening five men were sharing a motel room in Waco, Texas. One was in the shower and two others were outside talking on their cell phones. Jose Braule Ramirez, 33, and Juan Antonio Salano Castellano, 35, were eating dinner inside the room when Castellano passed gas. According to the police report, Ramirez took offense and threw a knife at him, cutting him on the leg. He then stabbed Castellano in the chest with it. 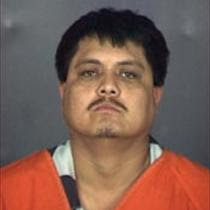 Waco police arrested Ramirez and charged him with aggravated assault with a deadly weapon. He’s cooling his heels in the McLennan County Jail on $15,000 bail. However he won’t be released on bond until authorities determine whether he is in the U.S. legally. Man stabbed over social faux pas. Hunh? That makes it sound like Ramirez stabbed him because Castellano was eating his salad with the wrong fork. Castellano experienced flatulence which upset Ramirez to the point he picked up a large knife and threw it at Castellano striking him in his leg. Note the passive voice: “Castellano experienced flatulence.” This implies that Castellano’s farting was beyond his control, a mere accident. It further implies that Ramirez’s response was unprovoked. Channel 25 apparently views Castellano as an innocent victim, but is he? In Erving Goffman’s classic sociological account, farting is an accidental violation of social etiquette. Jose Braule Ramirez clearly doesn’t buy Goffman’s theory and neither do we here at First Nerve. Deliberate farting happens all the time and out in the real world it can be intended—and accurately perceived—as a provocation. Does it justify assault with a deadly weapon? That’s for the jury to decide, not the sociology majors at KXXV-TV.